Web application scanners are tools used to automatically identify security vulnerabilities in websites, web applications and web services. Scanners are able to look for, detect, and report about technical vulnerabilities such as the ever-present SQL Injection and Cross-Site Scripting (XSS). It does so in a fraction of the time it takes when performed manually, saving IT security teams hundreds of man hours. 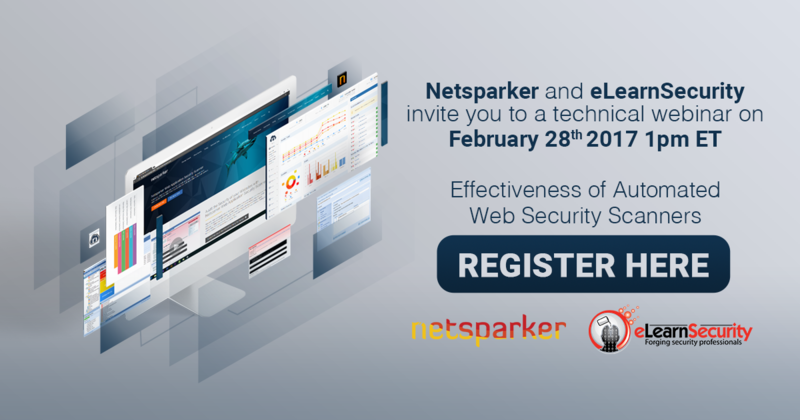 Netsparker’s approach to web app security takes the ease of using scanners one step further through Proof-Based Scanning. Once a flaw has been detected, this technology automatically (and safely) tries to exploit the vulnerability to confirm that it’s not just a false positive reading. Thus freeing the team from the drudges of having to double check each identified vulnerability. Ferruh will also be showing you the Netsparker Web Application Security Scanner and their unique and dead accurate Proof-Based scanning technology at work. And, as usual, it’s best to prepare your questions ahead of time – he’ll be fielding your queries towards the end of the webinar. Our teams from the US, UK, Italy, UAE, and Turkey will all be coming together for this event – you can join us from wherever you are in the world by registering here and by making sure that you’re there with us when we go live on February 28th 2017 at 1 PM ET.